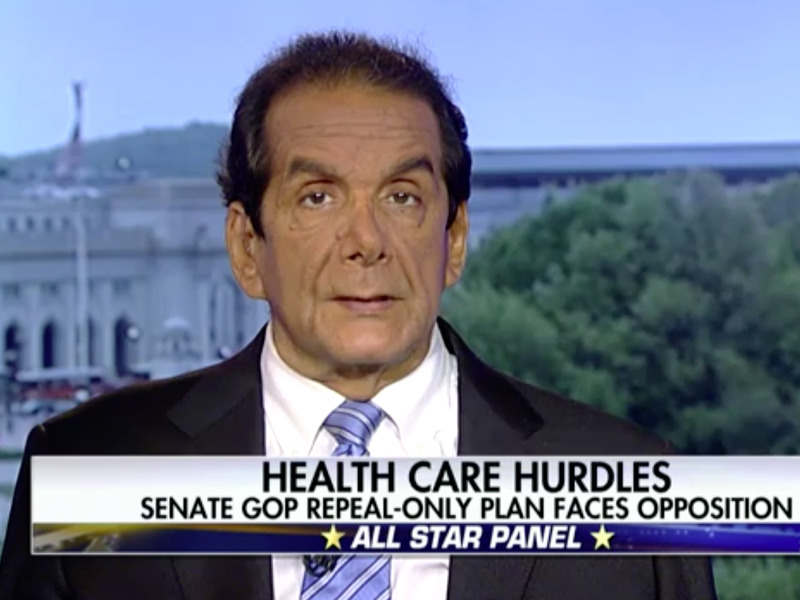 Conservative pundit Charles Krauthammer slammed President Donald Trump and Senate Republicans’ unsuccessful attempt to repeal and replace Obamacare, calling it the “end of the road” for the GOP’s healthcare efforts. Krauthammer argued that there are three reasons why the repeal and replace effort failed. First, he said it’s almost impossible to “abandon” a government “entitlement” once it’s been created or expanded. Second, Krauthammer claimed Trump showed “no presidential leadership” on the issue, unlike in 2009 and 2010 when Obama campaigned heavily for his healthcare bill, and the party failed to make a compelling case for their proposal. “Did anybody make the case for what was in this bill in the Senate, other than that it was a promise?” he asked. Lastly, Krauthammer blamed the failure on the “almost unbridgeable” divides between the moderate and conservative wings of the Republican caucus, both in the House and Senate. The GOP bill fell apart Monday night when two more GOP senators — Jerry Moran of Kansas and Mike Lee of Utah — announced their opposition to the bill.